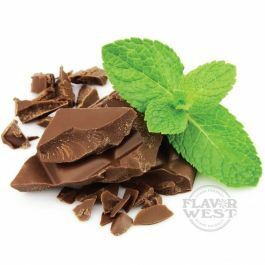 Smooth and powerful creamy chocolate collaborates with cool mint to produce delicious chocolate mint flavor. Indeed it is rejuvenating, spice up your drinks and baked treats to its richness. Type: Chocolate Mint Water Soluble Flavoring. Ingredients: Natural and Artificial Flavoring, Propylene Glycol. USP Kosher Grade Flavoring. Usage Rate: 15-20% for E-use. Flavor suitability: Suitable cakes, yogurt, ice cream, pudding, coffee, tea, cream, and much more. Specific Gravity: 1.04 No Refunds on Flavoring.